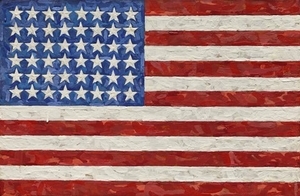 The Crystal Bridges Museum of American Art will soon announce major purchases that fill gaps in its collection and fulfill its mission to include more women in the canon of American art: Jasper Johns's renowned "Flag" painting from 1983, which the museum bought at Sotheby's in November for $36 million (outlasting three other ardent bidders), and four works by Louise Bourgeois, including her monumental bronze, steel and marble spider sculpture "Maman." The Bourgeois purchases, concluded in December 2014, together are worth an estimated $35 million to $40 million. In the last year, the Bentonville, Ark., museum, financed largely by the Walmart heiress Alice Walton, has spent close to $150 million on art. In March, it disclosed 16 purchases, including a Robert Rauschenberg combine and five works by Helen Frankenthaler, worth at least $20 million. In February, the museum said that it had bought Georgia O'Keeffe's "Jimson Weed/White Flower No. 1" at Sotheby's last fall for $44.4 million, outbidding six other rivals and setting an auction record for a female artist. Crystal Bridges has made smaller purchases that remain unannounced, including a painting by Ghada Amer, according to her dealer, Cheim & Read. At the auction where "Flag" was sold, the anonymous bidder who bought the Johns — now identified as Ms. Walton — also won Mark Rothko's "No. 21 (Red, Brown, Black and Orange)" for nearly $45 million; a marble-and-steel Bourgeois sculpture titled "Distant Figures" for $1.8 million; and a Joseph Cornell box, "Untitled (Palais de Cristal)" for $665,000. Only the Cornell has so far gone into the museum's collection, officials there said, but Ms. Walton has in the past indicated that she will give much of her own collection to the museum eventually. She declined to be interviewed. "Flag," a 48-star American flag made of wax encaustic on silk flag on canvas, will be showcased in a niche gallery at the entrance to the museum's permanent collection beginning June 13, the day before Flag Day. The Bourgeois purchases align with the museum's intention to build its trove of art by women, often in depth. Of the 674 artists represented in its collection, 117 are female — a fairly strong percentage compared with many museums. "Bourgeois is really important to 20th century art and yet she has not received the entire due that she deserves," said Margaret C. Conrads, the Crystal Bridges director of curatorial affairs. 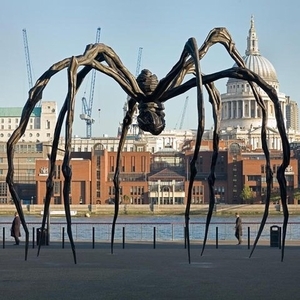 "Maman," which measures more than 30 feet both in length and height, will be installed outdoors this summer. "Quarantania," a bronze and steel sculpture representing the Bourgeois family, is already on view, and two paintings from the 1940s — said by Cheim & Read to be the only Bourgeois paintings in any American museum — will be hung this summer. This short item follows another I published in March in The New York Times about purchases by Crystal Bridges (scroll down).